Tonight we’re eating chicken and smoked sausage gumbo made with a traditional roux, red wine, and various spices served over jasmine rice. A: So I know this wasn’t like your normal gumbo, T, but what’d ya think? T: It was good. 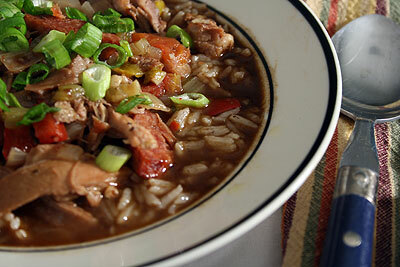 I love chicken and sausage gumbo. You know, it fits right into my favorite category of food. Smothered meat with rice. I thought it was good. A little strong on the red wine. I thought. A: that’s to say, on the bad side of strong? T: I think it could have used a little less, but that’s just my opinion. A: well I thought the gumbo was quite tasty, perhaps in this case I am using gumbo as a loose term, but the traditional ingredients of a roux, chicken, sausage, onions, celery, bell pepper, and garlic, were all present. Granted, my bell peppers were not green (they were yellow and red), but still, pretty traditional. I guess the untraditional aspect was the red wine (and the rotel tomatoes), but these are the gumbo tricks I picked up from learning the Chimes’s Recipe. So what’d you give it? T: I give it an 8.5/10. I thought it was tasty, but the wine was a little strong I thought. That’s really the only negative thing I have to say about it. A: I’m sorry you felt that way, I didn’t really see the wine as being that strong of a flavor, personally. I give the gumbo an 8.6/10. It was good. It floated my gumboat. T: Are we going to eat anything spooky for halloween? A: If you consider all the germs we’re going to ingest on Carlotta spooky, most certainly we are. T: I don’t know what you’re planning on doing at Carlotta, but I plan on staying quite clean…… Anyway, cold weather is good for eating gumbo, but it’s not so great for being out in. A: as long as you’re not out for too long, it’s alright. T: and as long as you’re not biking. Kwaherini ma bibi na mabwana.